Nature lovers and outdoor enthusiasts. An opportunity to travel off the beaten path with environmentalist and bird expert, Michael Mills (for more on Angola’s birds, go to www.birdsangola.org). You will be camping and need to be self sufficient in all aspects including transport. A four wheel drive definitely a necessity. You can accompany Michael on all or part of his trips as per the schedule below. To attend contact Michael Mills at michael@birdingafrica.com and his phone number: 934-969865. On your email please ‘cc’ angolafieldgroup@gmail.com since Michael is travelling in northern Angola and not always within communication range. Summit of Mount Moco in Huambo province. Photos courtesy Michael Mills. Gabela Akalat, endemic to the central scarp forests of Angola; endangered. Photo courtesy Michael Mills. THIS FIELD TRIP IS NOW FULL. On Sunday, February 20th the Angola Field Group has the opportunity to go birding with South African bird expert, Michael Mills. A professional birding guide, Michael has been coming to Angola to study birds since 2003. (Scroll down to previous post to read his bio.) We will be heading northeast, taking the Caxito – Uige road where there are still some stands of forests and where the endemic Turaco can be found. In order to get in some morning birding, we will be leaving the city at 5:00AM. This will be a full day trip and no guarantee that we will be back in Luanda before dark. A four wheel drive vehicle is necessary. We must keep numbers to a strict limit so please only sign up if you’re serious about going. Final trip details including our meeting location will be given once you’ve signed up and are confirmed for this trip. 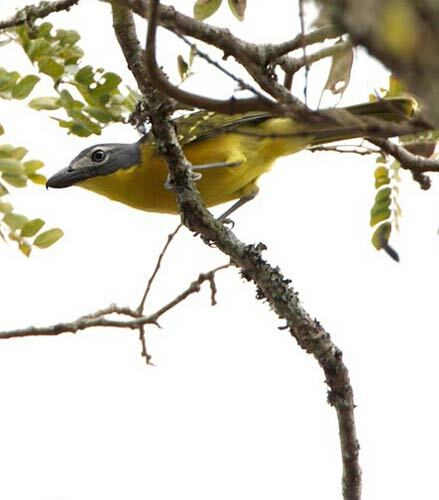 Monteiro's Bushshrike, endemic to the central scarp forests of Angola; data deficient. Photo courtesy Michael Mills. To register for this trip, email Henriette Koning at: angolafieldgroup@gmail.com. All Angola Field Group trips are at your own risk. 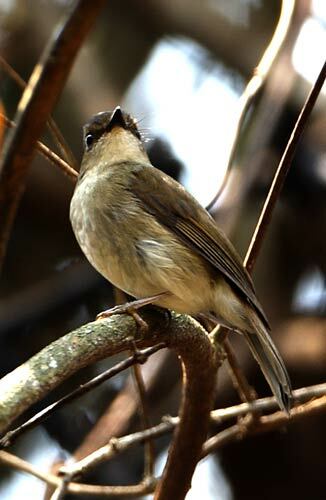 Pulitzer's Longbill endemic to Angola's central scarp forests; endangered. Photo courtesy Michael Mills. Gabela Helmet Shrike, found only in Angola. Photo courtesy Michael Mills. Angola is considered off the beaten path when it comes to ‘birding tourism’ and remains a poorly known region in the realm of African birds. Ironically 30 years of war protected some of the rarest bird species that now are being threatened by development and a growing population. The Angola Field Group invites you to a presentation “Protecting Angola’s threatened birds and their threatened habitats”, at the Viking Club, Thursday February 3rd at 8:00 PM with Michael Mills, a South Africa bird expert who will talk about bird conservation in Angola and the important bird species that are being studied. (www.birdsangola.org) He will also update us on his projects including the well-known Mount Moco forest project in Huambo province (www.mountmoco.org) and give us a look at other projects he’s involved in such as Africa’s third largest bird skin collection on display in the Lubango museum. Michael is a South African conservation biologist and has been watching birds for 25 years and guiding birding expeditions since he was 16. He has been studying birds in Angola for almost 8 years and works for BirdLife (www.birdlife.org), an international bird conservation organization. He also leads bird watching tours in sub-Sahara Africa. 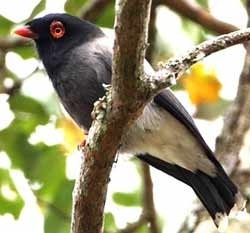 The first CD sound guide dedicated to Angolan bird calls, over 100 species, recorded by Michael Mills, will be on sale. Everybody is welcome to attend. The talk will be in English. In close cooperation with the Viking Club, this event is offered free of charge. Alcoholic and non-alcoholic beverages and snacks are sold at the bar, coupons must be purchased. The Viking Bar opens at 7:30 PM! You can download a map showing the location of the Viking Club on this website’s Join Us page. The Viking Club is on the main floor of the former Swedish Building at Rua Marien N”Guabi, No 118 in Maianga, across the street from the new Panela de Barra restaurant. Field Trip: We will be going on a birding expedition to the Denbos with Michael Mills in February. Date and details will be given on Thursday, February 3 and on this website. 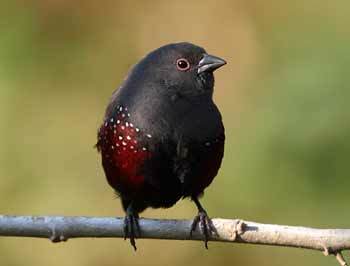 Dusky Twinspot, exists only in the highlands of Angola and Uganda. Photo courtesy Michael Mills. His work in Angola is focussed on BirdLife’s priorities of protecting habitats for threatened birds, and improving knowledge of threatened and poorly-known species to enhance our ability to conserve them. 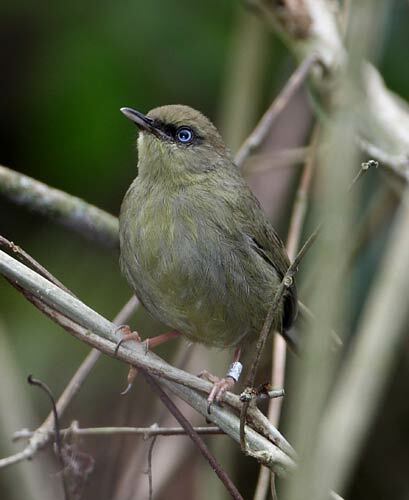 Two main project sites are under development in the main habitat types for threatened endemic birds: in the Afromontane/highland forests at Mount Moco, and the central Scarp Forests at Kumbira. Most of what Michael will be talking about will be about this work, and the most important bird species that are being studied. He will also detail several other projects that he’s been involved in, including the databasing of Africa’s third largest bird skin collection in the museum in Lubango, the discovery of some new and significant Afromontane forests, the production of a CD of Angolan bird calls, the long-term planning for a bird atlas of the country, some new and important bird finds in Angola, and the first field information on the rare Black-tailed Cisticola. Michael also runs two websites on Angolan birds www.birdsangola.org and www.mountmoco.org. 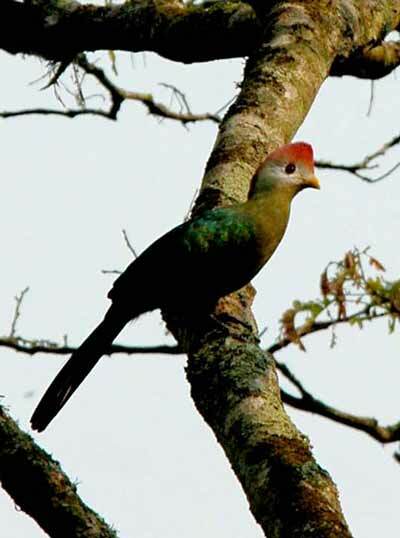 Red Crested Turaco, found only in Angola. Photo courtesy Michael Mills. View from the top of Mount Moco looking north-west. Photo courtesy Michael Mills. 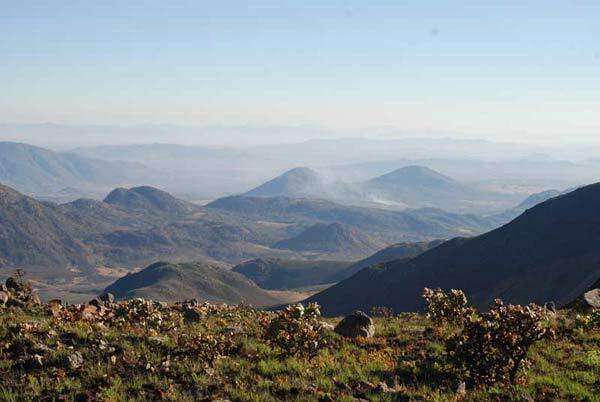 The Angola Field Group invites you to climb Angola’s highest mountain, Mount Moco, located in the central west province of Huambo – May 29 to June 01. Stretching up to 2620 meters, Mount Moco’s true importance is the fact that it has the best examples of Angola’s rapidly disappearing Afromontane forest and it is home to several rare birds. We will be accompanied on our trip by Dr. John Mendelsohn, a zoologist specializing in ornithology. The slopes are steep so participants should be in reasonably good shape and wear sturdy shoes with a grip. We will depart Luanda Saturday May 29 at 7:00 AM and arrive in Huambo, the capital city of the province Huambo, late afternoon. It’s approximately a 9 hour drive from Luanda to Huambo. 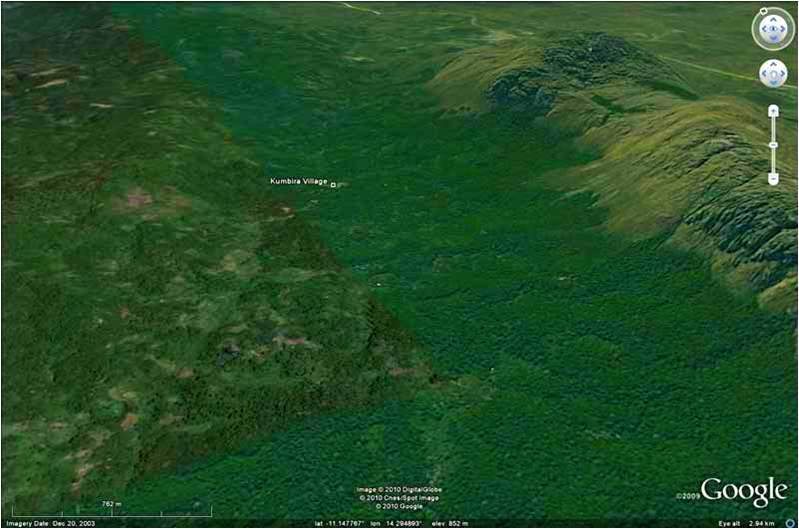 Sunday morning we will head for Mount Moco, set up camp and explore the area with Dr. Mendelsohn. Then very early Monday morning we’ll hike up the mountain with some local guides and hopefully be back in Huambo early evening to have dinner at a local restaurant. Tuesday (national holiday) early morning departure for Luanda preceded by a city tour of Huambo. Saturday and Monday we will be accommodated in a homestay run by our guide/host, a Swiss expat who has made Huambo his home for the past 6 years. Meals, including while we are camping, will be provided by the homestay except for Monday evening. Shared accommodations in the homestay. Sunday we will be camping – bring your own gear but some mattresses are available. Price to be posted Monday. Sign up opportunity Thursday May 13th at the Field Group presentation, scroll down.